Organizer of Chabad event wonders why Tel Aviv bans gender-segregated event only in Rabin Square but nowhere else. Benzi Frishman, one of the organizers of the Chabad 'Messiah in the Square' event, discovered Friday that the Tel Aviv Municipality has agreed to allow the event to be held in any other location in Tel Aviv, except for Rabin Square. 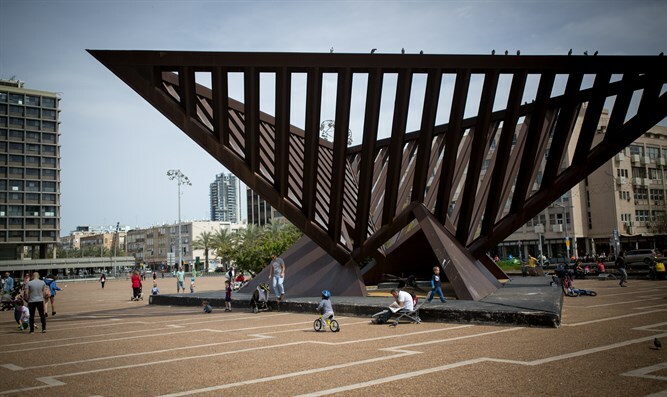 After the municipality informed the organizers of the event that it would not allow the event be held in Rabin Square in its current format, in which men and women would be separated, The municipality offered Yarkon Park as an alternative to Rabin Square. "They suggested that we do it elsewhere," Frishman said. "If the problem is women's honor and a government decision, why is it okay in any other place in Tel Aviv or Bnei Brak?" Frishman told Channel 14: "There was an event two years ago at Rabin Square that took place without any problems. According to our agreements with the municipality, we had permission to hold it until this whole mess arose." "If we do not have a partition, many women will not want to come," explained Frishman. .
Michal Shalev-Freicher, president of the Secular Forum: said that "we need to preserve secularism, the values ​​of humanism and equality, but not an empty pluralism that allows us to be run over in our own cities." "To hold the event in Rabin Square is akin to holding the Gay Pride Parade in Bnei Brak, Tel Aviv is a free city. To hold the event n Rabin Square is a sign that they oppose the secular symbols. "Chabad is the world's champion in pluralism - until it affects them," Shalev-Freicher said. "Chabad has access to our children in their schools, without their parents. The secular space is in danger and we have to defend it. If we do not do so then we'll be left with nothing - no beaches, no schools, nothing." The organizers of the 'Messiah in the Square' event petitioned the Tel Aviv District Court after the municipality announced that it would not allow the event to be held with men and women separated. The hearing on the petition will take place on Sunday. The event is scheduled for this coming Monday.